Robins’ Nest offers a wide array of community-based residential and in-home services that protect children, strengthen families and build stronger communities. Its headquarters are on Delsea Drive in Glassboro. It also maintains satellite offices in Elmer, Salem City, Vineland, Mullica Hill and Egg Harbor Township. 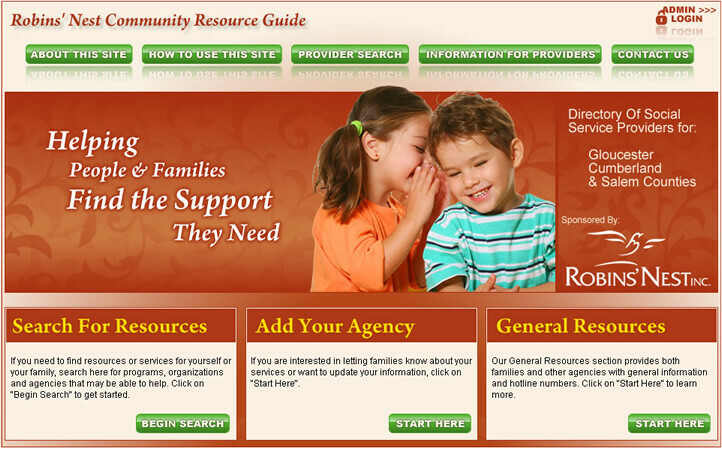 DiFabio said Monday the Web site is a resource where families and agencies can see what services and programs are available in the area. “We hope it has a positive affect on Salem County,” he added. The online database, robinsnestcommunityresourcedirectory.org, contains more than 300 unique entries of services offered in Gloucester, Cumberland and Salem counties, as well as surrounding areas. It is the first of its kind for the Tri-County region, officials from Robins’ Nest said, developed through the agency’s Differential Response Program and Manna Design Works of Glassboro. On the Web site, people can take the first step to locating and getting in touch with numerous social services available in their areas. Classified in 35 different categories, the list includes resources for employment, counseling, child care, emergency food or shelter, legal aid, family preservation, rental assistance, and recreation, along with many other services. Entries on this site are updated and maintained on a regular basis as new and updated information is obtained from providers. Agencies are given the opportunity to add their resources by filling out a short questionnaire under the “Add Your Agency” link. There are also a number of local and toll-free hotlines listed there, as well. DiFabio said the Web site is meant to be user-friendly, and added the agency welcomes any feedback from the public. “At this point, we have received feedback from several sources and the feedback has been favorable,” he said. While the site is a resource for the public, DiFabio said the agency will also use it internally, as a way to better keep track of all the services out there. “It is really difficult to keep track of it,” he said when speaking of the available services. “It is all about trying to help families and agencies alike.” DiFabio added he hopes the site becomes a resource for all stakeholders in the area. For more information on Robins’ Nest, visit robinsnestinc.org. © 2010 NJ.com. All rights reserved.